Battery chargers come as simple, trickle, timer based, intelligent, universal battery charger-analyzers, fast, pulse, inductive, USB based, solar chargers and motion powered chargers. These battery chargers also vary depending on the applications like mobile phone charger, battery charger for vehicles, electric vehicle batteries chargers and charge stations. Charging methods are classified into two categories: fast charge method and slow charge method. Fast charge is a system used to recharge a battery in about two hours or less than this, and the slow charge is a system used to recharge a battery throughout the night. Slow charging is advantageous as it does not require any charge detection circuit. Moreover, it is cheap as well. The only drawback of this charging system is that it takes maximum time to recharge a battery. The aim of this project is to automatically disconnect a battery from the mains when the battery gets fully charged. This system can be used to charge partially discharged cells as well. The circuit is simple and consists of AC-DC converter, relay drivers and charge stations. In an AC-DC converter section, the transformer step-downs the available AC supply to 9v AC at 75o mA which is rectified by using a full wave rectifier, and then filtered by the capacitor. The 12v DC charging voltage is provided by the regulator and when the switch S1 is pressed, the charger starts working and the power on LED glows to indicate the charger is ‘on’. The relay driver section consists of PNP transistors to energize the electromagnetic relay. This relay is connected to the collector of first transistor and it is driven by a second PNP transistor which in turn is driven by the PNP transistor. In the charging section, regulator IC is biased to give about 7.35V. To adjust the bias voltage, preset VR1 is used. A D6 diode is connected between the output of the IC and a limiting output voltage of the battery up to 6.7V is used for charging the battery. When the Switch is pushed, it latches relay and starts charging the battery. As the voltage per cell increases beyond 1.3V, the voltage drop starts decreasing at R4. When the voltage falls below 650 mV, then the T3 transistor cuts off and drives to T2 transistor and in turn cuts off transistor T3. As a result, relay RL1 gets de-energized to cut off the charger and red LED1 is turned off. The charging voltage, depending on the NiCd cell, can be determined with the specifications provided by the manufacturer. The charging voltage is set at 7.35V for four 1.5V cells. Currently 700mAH cells, which can be charged at 70 mA for ten hours, are available in the market. The voltage of the open circuit is about 1.3V. The shut-off voltage point is determined by charging the four cells fully (at 70 mA for fourteen hours) and adding the diode drop (up to 0.65V) after measuring the voltage and bias LM317 accordingly. In addition to the above simple circuit, the real time implementation of this circuit based on the solar power projects are discussed below. 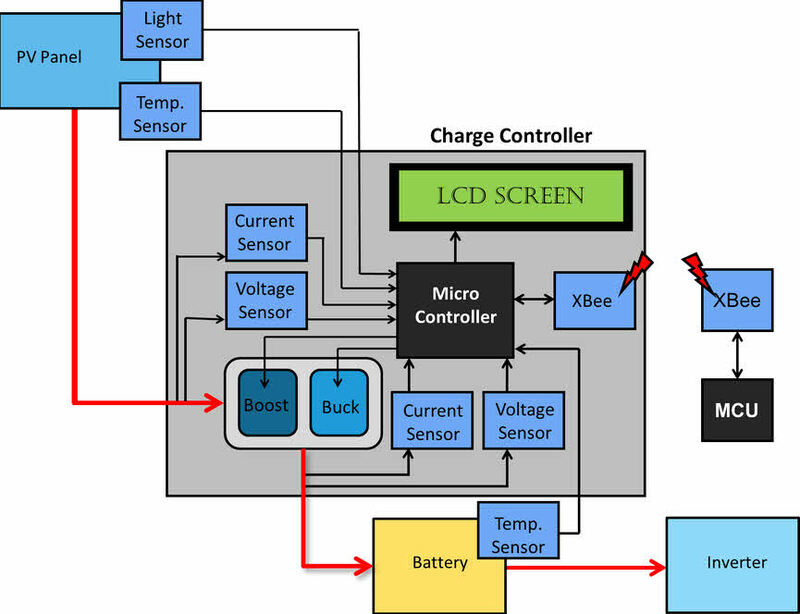 The main objective of this solar power charge controller project is to charge a battery by using solar panels. This project deals with a mechanism of charge controlling that will also do over charge, deep discharge and under voltage protection of the battery. In this system, by using photo voltaic cells, solar energy is converted into electrical energy. This project comprises hardware components like solar panel, Op-amps, MOSFET, diodes, LEDs, potentiometer and battery. Solar panels are used to convert sun light energy into electrical energy. This energy is stored in a battery during day time and makes use of it during night time. A set of OP-AMPS are used as comparators for monitoring of panel voltage and lead current continuously. LEDS are used as indicators and by glowing green, indicates the battery as fully charged. Similarly, if the battery is under charged or over loaded, they glow red LED. The Charge controller makes use of MOSFET – a power semiconductor switch to cutoff the load when the battery is low or in overload condition. A transistor is used to bypass the solar energy into a dummy load when the battery is fully charged and it protects the battery from getting over charged. The aim of this project is to design a charge controller with a maximum power point tracking based on a microcontroller. The major components used in this project are solar panel, battery, inverter, wireless transceiver, LCD, current sensor and temperature sensor. The power from the solar panels is fed to the charge controller which is then given as output into battery and is allowed for energy storage. The output of the battery is connected to an inverter that provides outlets for the user to access the stored energy. The solar panel, battery and inverter are bought as the off shell parts while the MPPT charge controller is designed and built by solar knights. A LCD screen is provided for displaying storage power and other alert messages. The output voltage is varied by pulse width modulation from the microcontroller to MOSFET drivers. The way to track a maximum power point by using MPPT algorithm implementation in controller ensures that the battery is charged at maximum power from the solar panel. This is how one can make one’s own battery charger for the mobile phones. The two examples mentioned here can make the process easier for you. Moreover, if you have any doubts and need help for implementing real-time projects and industrial battery charger circuits, you can comment in the comment section below. It really appreciable thought of giving such a nice information to which our world is much connected with, and the way you explained is good, but i feel that it would be better for understanding if it contains some more pictorial representation. As per your suggestion, we will try to add the number of pictures for the better understanding of the concept. If you want more project ideas please check out the link. Check out the link for all the latest updates on electronics and electrical stuff. Thankyou for this informative article. My concern is: you started off by explaining a mobile charger, but in the Auto-Turn off Battery Charger section, you made a circuit for a NiCd battery rated at 6.7 V.
I want to make a similar circuit but for a 5V Li-ion mobile battery charger with usb output. Can this circuit help me achieve that? I sincerely appreciate your kind response regarding my article and I have mailed your query to our technical team and I will update you as early as possible. For more project ideas check out the link. IN TRAINS 110 DC SUPPLY IS AVAILABLE FOR US..THERE ALSO WE CONNECT OUR CHARGER TO CHARGE THE MOBILE…BUT NOW MY DOUBT IS OUR CHARGER CONSISTS TRANSFORMER…SO HOW AND WHAT OPERATION IS DONE AT THAT TIME..??????? Please once again check the voltage in your train service. I think it is 110AC voltage, because all fans and ACs are run with AC voltage only in railways. and you may get charged by 110AC to 5v DC using your mobile charger. Thank you so much for your feedback. Hope this article helped you a lot. For ppt and project details please email us on team@elprocus.com and our technical team will help you out. For more project ideas please check out the link. can i get a code to program the micro controller used for battery charging circuit??? We are very sorry to inform you that once you purchase the project we can provide the circuit diagram, programming, and documentation. Thanks for your appreciation. Hope this article helped you. can u suggest me any circuit to use one 12v 5ah rating battery [ of u.p.s ] as power bank . I will be extremely gratefull to you. Hello, please i need help on how to construct a simple torchlight which would be powered mechanically by the conversion of winding energy to electrical energy, wherein the control will be an SPST switch. Please write your query to team@elprocus.com and our technical team will help you for sure. We are very sorry to inform you that we don’t have this project with Micro controller. The Auto Turn off battery charger circuit shows AA batteries connected at the output end. Can this circuit be modified to have a USB connector at the output end such that the phone can be directly connected to this circuit? Will it work in the same way if a mobile is connected at the output end? I’m trying to implement a similar sort of working for my major project – i.e. to develop an efficient mobile phone charger which cuts off the power supply to the phone once it is charged to 100%. Any suggestions on how to do this (I’ve even thought of using Arduino board for communication between the circuit and the phone but not sure) would be invaluable. Our technical team will help you out. Please let we know the title of your project? Or else please send your specifications & requirements to our official mail id:team@elprocus.com and our technical team will help you out. Thanks for reading our article. 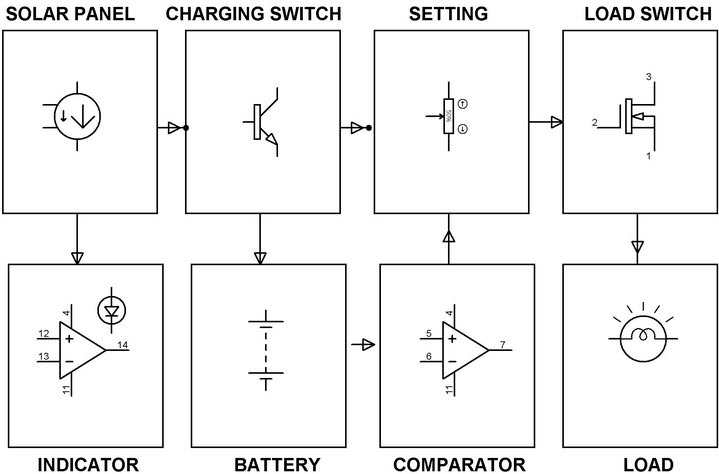 As per your query check out the link for the mobile charger circuit and its working principle. Hope you will like it. Thanks for reading our article. As per your query please check the link for how to make a solar charger. Hope this will help you.